Sampdoria put out a hilarious message to Arsenal fans to stop them from clogging up their tweets with reaction to Lucas Torreira’s impressive performances. 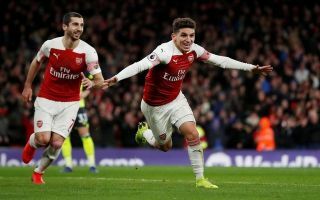 Torreira sent fans into a frenzy yesterday afternoon when he scored an overhead kick winner for the Gunners in the 83rd minute of their Premier League clash against Huddersfield. Arsenal fans then began to flood Sampdoria’s twitter account with a flurry of messages thanking the Italian club for Torreira. The Serie A side have pleaded with Gooners to stop ‘clogging up their match tweets’ and they are in the process of setting up a dedicated ‘Thanks for Torreira’ email address that Arsenal fans can send their kind words to. Arsenal signed the combative Uruguayan from Sampdoria for a fee of £26.5m according to The Guardian, the deal could prove to be the bargain of the season. No we must bombard u forever . Youre my fav italian club right now ? Thanks @sampdoria_en, please hit us up if you got any decent wingers or wing backs..
What a club Sampdoria are.